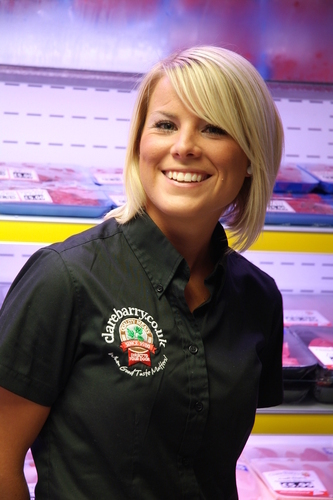 A long-established Midlands butcher has ‘reinvented’ the company to become a booming national online retailer – after a ‘dreadful year’ of being hit by floods, the credit crunch and competition from supermarket giants. Clare Lusted, from www.clarebarry.co.uk says she and her father Barry realised they needed to take ‘drastic action’ when their shop became deserted last summer – as the surrounding streets in Evesham, Worcestershire, were submerged under six feet of water. “Evesham was a ghost town, we were stranded at work, we looked at each other and just thought why don’t we really push this internet thing?” said Clare. Clare says that as well as the floods, the business, established for 25 years, was also hit by cut-price competition from supermarkets as cash-strapped customers were attracted by multi-million pound advertising campaigns. And she feared for the future of High Street shops because of spiralling fuel and parking costs. But the site – which only sells meat from animals reared by UK farmers, built up more than 2,000 customers in just five months after the floods. She said: “Our customers know it’s more economical to buy meat from us than the supermarket due to its superior quality and taste. “We still have strong local trade. But we knew there was potentially a nationwide market for high quality meat and we were really keen to continue to support British farmers. “We only buy our fresh meat and poultry from British farms and wholesalers and source our produce locally wherever possible. “This is because we strongly believe, and our experience has shown, that British meat and poultry is the best. Now Clare has overseen a rehaul of the website at www.clarebarry.co.uk and is spearheading a new marketing push. She added: “With the UK becoming ever more health conscious, people generally seem to be seeking more healthy and economical options. “We’ve found that people want the convenience of a supermarket but the quality of the local butcher. They are beginning to understand now that you can have fresh meat delivered and due to technological advances, its quality is not going to suffer in transit. “Online meat trading is in its early years and many people still don’t yet understand it’s possible. Trust from customers can be an issue with a website – but we deliver what we say we will and customers come back. “You can still buy quality meat and poultry with the friendly customer service that you get in a traditional butcher’s shop. “Whether you’re in a busy city centre or out in the countryside you don’t need to leave your armchair to get that sort of service anymore. For more information, please contact Clare on 01386 761221. This press release was distributed by ResponseSource Press Release Wire on behalf of The Marketing Room (Passionate Media Relations) in the following categories: Food & Drink, Farming & Animals, for more information visit https://pressreleasewire.responsesource.com/about.